Pakistani women are capable of changing the world and Marium Mukhtiar was also among those women. 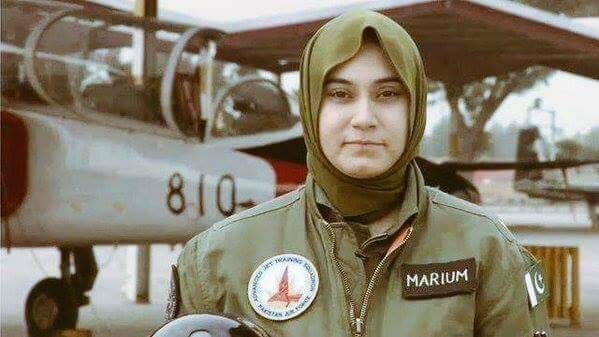 It was reported that Flying officer Marium Mukhtiar died in the F-7 plane crash near Kundian, Mianwali. According to reports, she was on a routine flight with squadron leader Saqib Abbasi. Spokesperson of Pakistan Air Force (PAF) said that she had got injured in the incident but could not fight the injuries. "She is first female pilot to be martyred", the spokesperson added. “Flying Officer Marium Mukhtiar, a female fighter pilot trainee, and an instructor Squadron Leader Saqib Abbasi have suffered injuries during their ejection from the aircraft,” the statement added. The official statement said that both pilots were airlifted to hospital for medical treatment. Marium Mukhtiar last year in an interview to BBC told that she wanted to do something different. 22 years year old Marium is pride of Pakistan and whole nation grieves over her death. She stood a head in a male dominated society and broke the traditional barriers. Her desire was to do something which could encourage other women of Pakistan to break the taboos and come forward. Pakistan has now almost 300 women working in airforce, while in recent years many women tend to join air force which was a great achievement.